President Donald Trump says it is time the US recognises Israel’s sovereignty over the occupied Golan Heights, which it captured from Syria in 1967. In a tweet, Mr Trump declared that the plateau was of “critical strategic and security importance to the State of Israel and regional stability”. 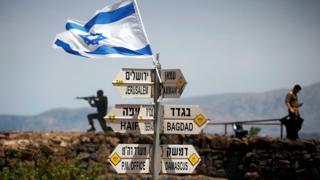 Israel applied its administration and law to the Golan in 1981, but other governments did not recognise the act. Syria has consistently sought to regain sovereignty over the region. Israeli Prime Minister Benjamin Netanyahu, who has warned about the military “entrenchment” of his country’s arch-enemy Iran in the Syria conflict, tweeted his thanks to Mr Trump on Thursday. “At a time when Iran seeks to use Syria as a platform to destroy Israel, President Trump boldly recognizes Israeli sovereignty over the Golan Heights,” he wrote. There was no immediate response from the Syrian government.